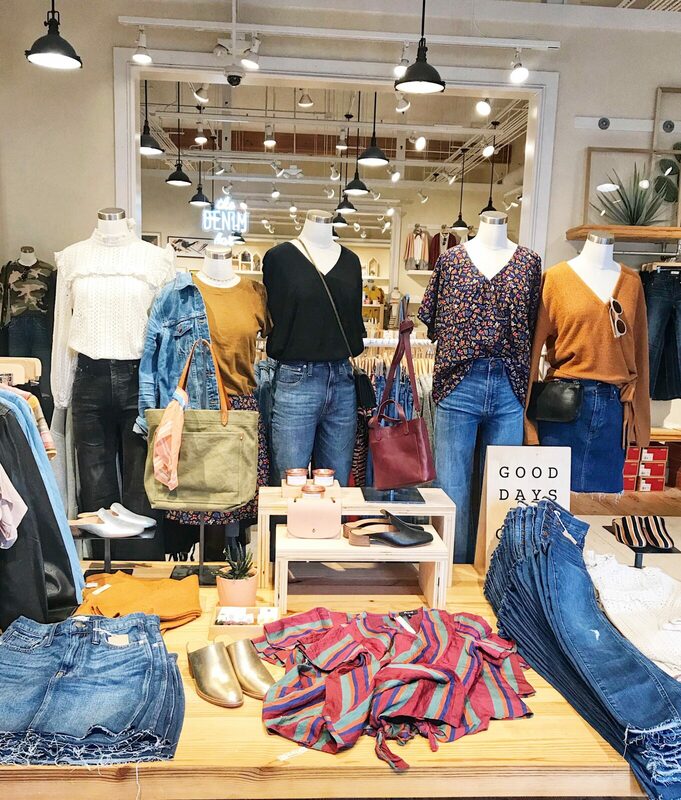 popping in on a saturday to bring you a quick rundown of a few cute things currently on super sale at loft right now. enjoy 40% off your purchase with code FALLFEST. 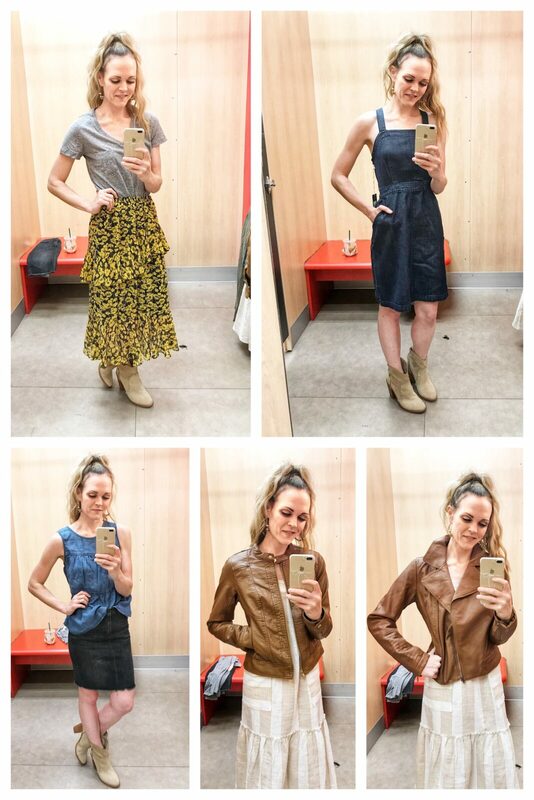 in honor of the sale (and the fact that loft has some CUTE wardrobe basics in their current collection), i stopped by the store on thursday afternoon for a little try-on session (you can see it in my instagram story highlights under “shopping” and i’ve also linked everything on the liketoknow.it app). 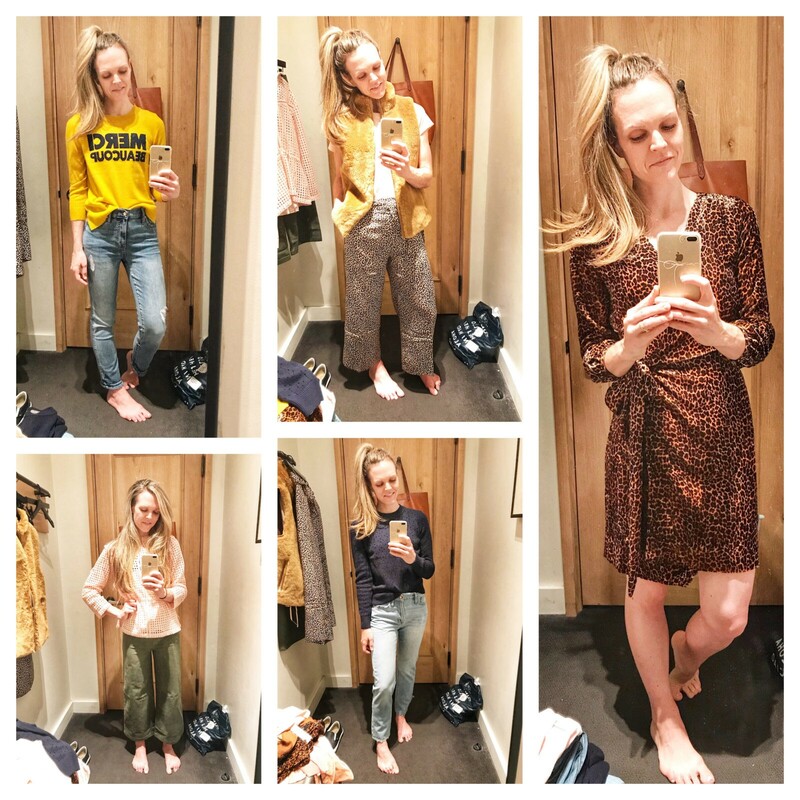 while i left empty-handed, i was reminded why i love to shop at loft from time to time when i’m in search of quality and cozy cold-weather staples. no one does a comfy sweatshirt better! striped long sleeve shirttail tee (xs) || who doesn’t love a good fitting tee? especially one with a longer hemline (a big win for my fellow long-torsoed gals) in a cozy cotton fabric. 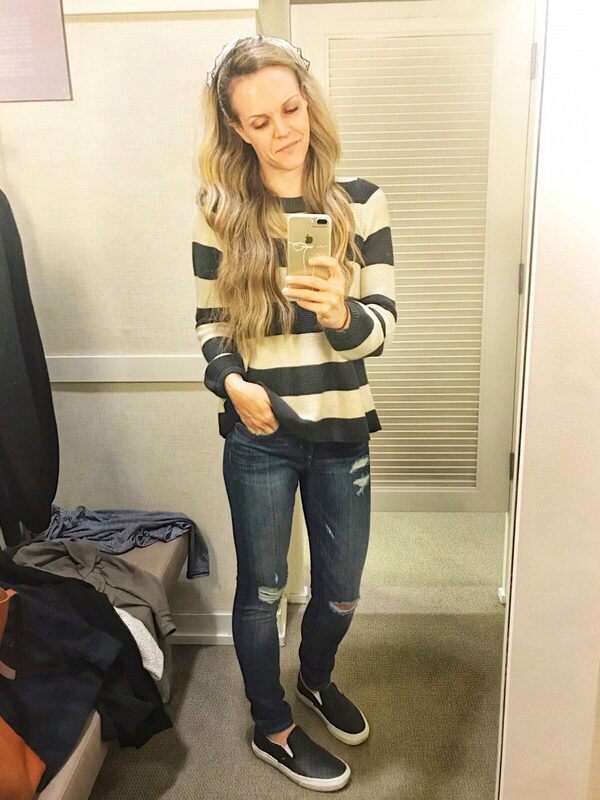 i initially grabbed this striped number as a layering piece to try-on under the below cardigan, but in all honesty, it was the one item i actually considered purchasing. it’s light-weight enough for layering beneath a sweater, vest, or jacket, yet substantial enough (see also: not see-through) to wear on its own. 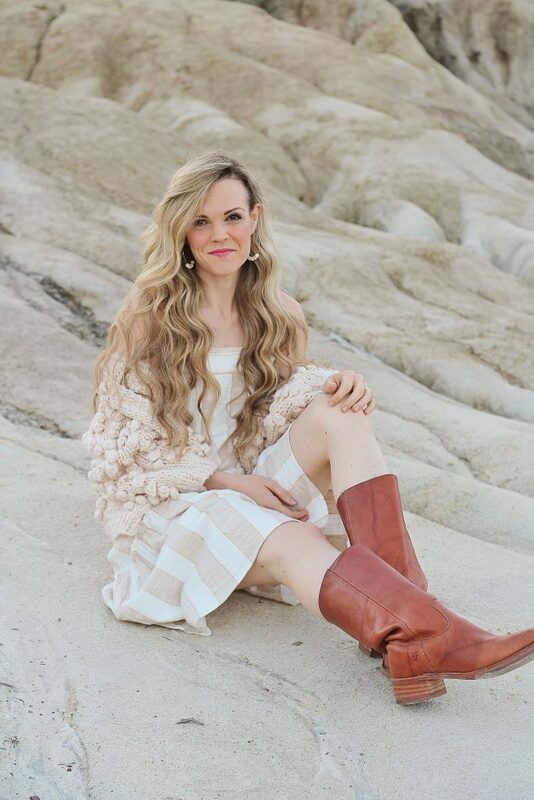 it also comes in a grey stripe and with the discount -is about $25.00 which is a great price for a closet basic that you’ll have for seasons to come. 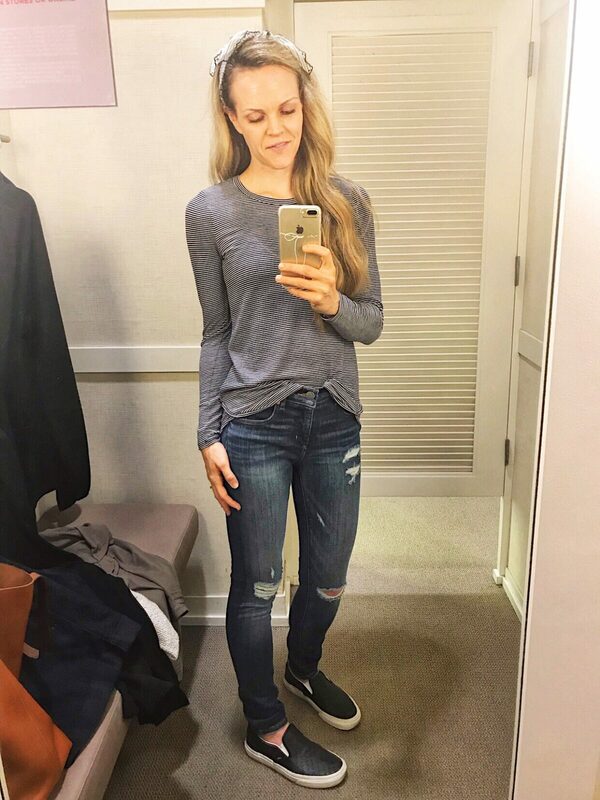 modern distressed high rise skinny jeans in mid indigo wash (2/26) || similar to the tee, i grabbed these distressed skinny jeans on a whim so i could change out of my workout leggings during the try-on. 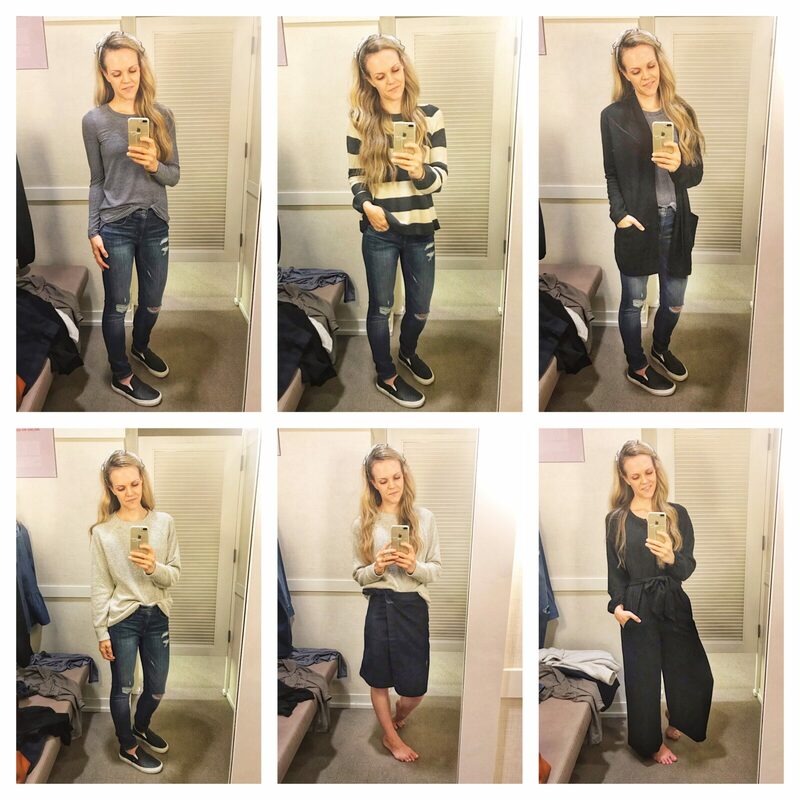 i’ve worn loft denim in the past, but always found them to stretch out over time. obviously i can’t speak to this particular pair seeing as i wore them for approximately 17 minutes, but i was impressed by their quality and flattering fit. i even managed to avoid ripping the subtle distressing with my feet (anyone else have that problem? i have to overly exaggerate pointing my foot to avoid hooking my big toe in the rip and slicing it straight down the middle). 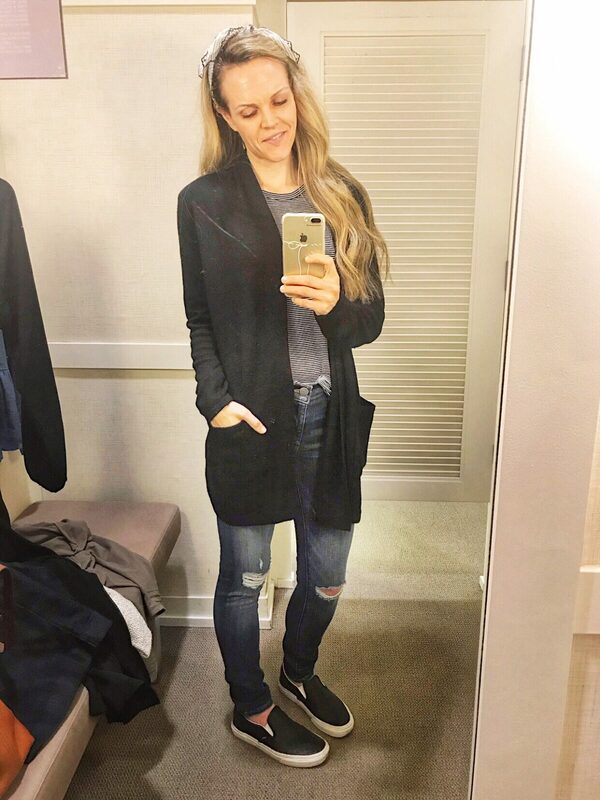 shawl pocket open cardigan (small) || okay so are you familiar with madewell’s ryder cardigan? this shawl pocket style from loft is a total dupe at a fraction of the cost. honestly, it may be better. i would have preferred to try-on the camel color, they didn’t have my size in the store, so i grabbed the black one instead (it also comes in charcoal grey and blush pink). with a flowy fit, i would probably size down to an x-small, especially for layering over a light-weight tee or camisole. it’s so cozy and a steal at under $50.00! striped swingy sweater (xs) || this sweater gave me all the nautical vibes in the best possible way. while i prefer a non-swingy silhouette, the slight balloon-sleeve detail redeemed it for me. as i mentioned in my instagram story, the open hemline would be accommodating for a growing baby bump or for those who prefer to have a little room around their midsection. this classic knit also comes in white with black piping which gives me all the coco chanel vibes -so chic! lou & grey ridged sweatshirt (small) || our local loft store has a small section dedicated to their lou & grey line so i took it as the perfect opportunity to see what cozy goodness they currently have in their fall collection. you guys, if you haven’t sampled anything from lou & grey, i highly suggest you do! they’re stuff is hands-down the comfiest stuff i own! 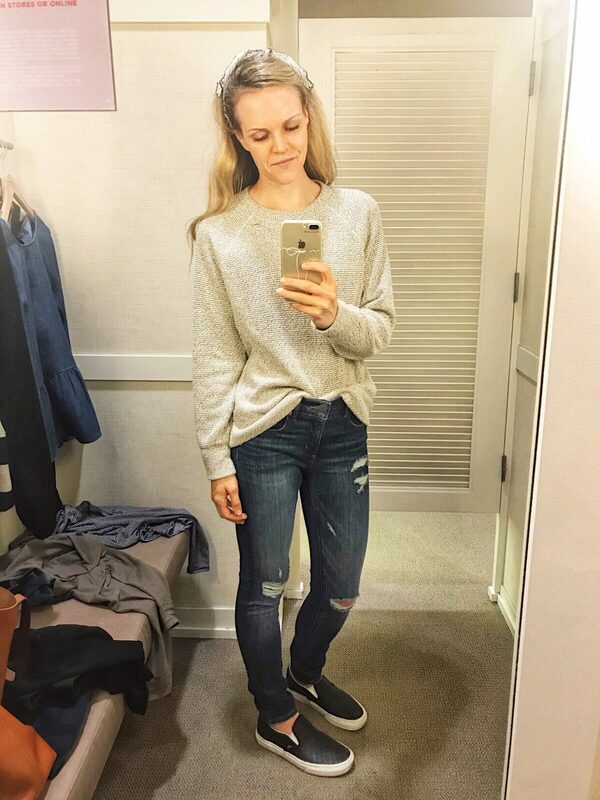 i need another sweatshirt like i need a hole in my head, but this marled grey sweatshirt is a great option if you’re in need of a multi-purpose top. it’s great with jeans (as seen above), but would be adorable with a denim skirt (see below), or even a pair of wide-leg pants and leather booties for a business casual look. 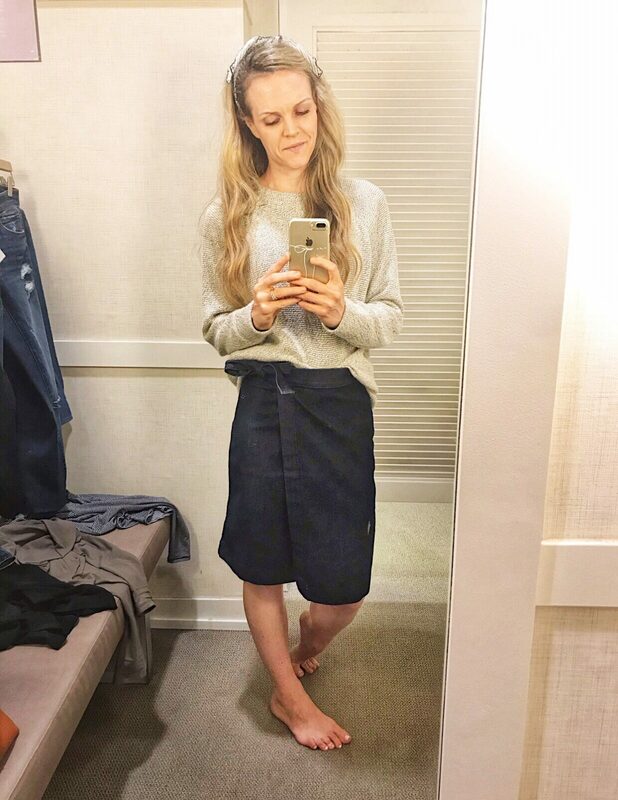 denim wrap skirt (0) || the hunt for an appropriate-lengthed denim skirt continues…while this tie-waist wrap silhouette was certainly cute, the midi-length felt a bit matronly on me. i do love the dark denim for fall and think on the right person, it would be adorable paired with leather booties or mid-calf boots and a crisp white button-down. size verdict: true to size, though you could size down if your waist is smaller than your hips (i usually size down at loft when it comes to skirts/dresses). 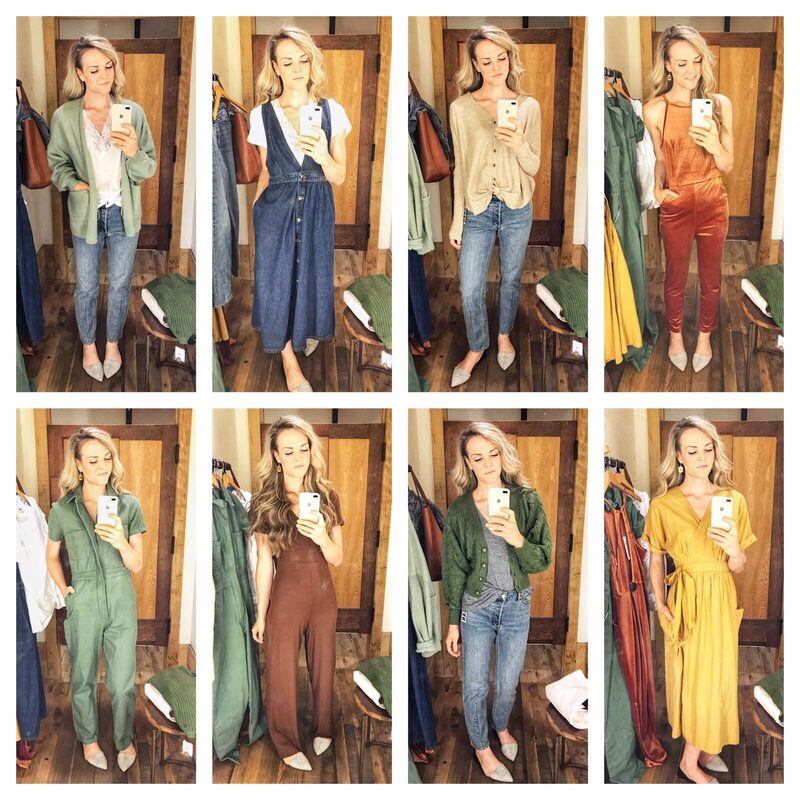 lou & grey blouson tie waist jumpsuit (xs) || finally, i couldn’t leave the store without trying on a jumpsuit! i found this one in the lou & grey section and fell instantly in love with its wide-leg style and the fact that it had long-sleeves (a rarity but so great for cooler weather). while it fit perfectly everywhere else, it was just a touch too short in the inseam (womp, womp). 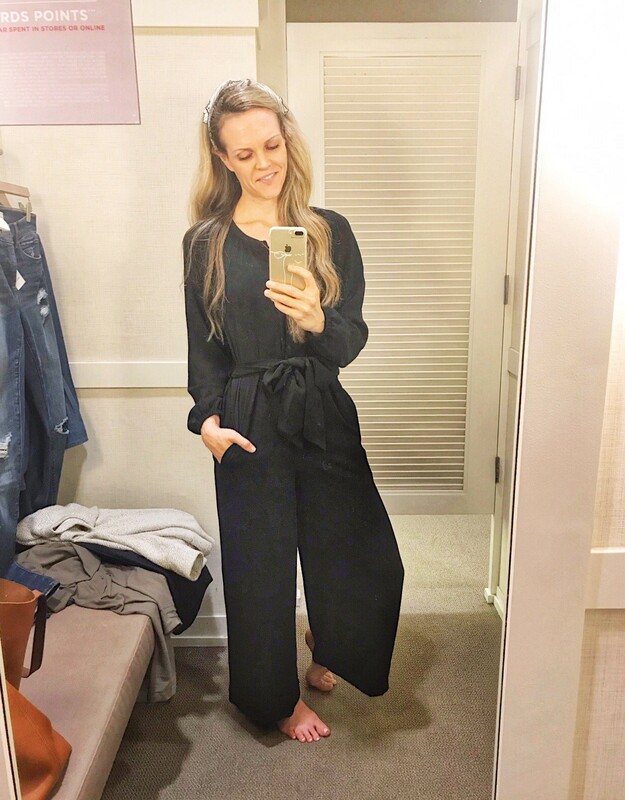 BUT if you’re on the more petite side, this jumpsuit is as comfortable as wearing pajamas and would be perfect for dressing up for the upcoming holiday season. i would have paired it with a metallic sandal or leopard bootie and a red lip. 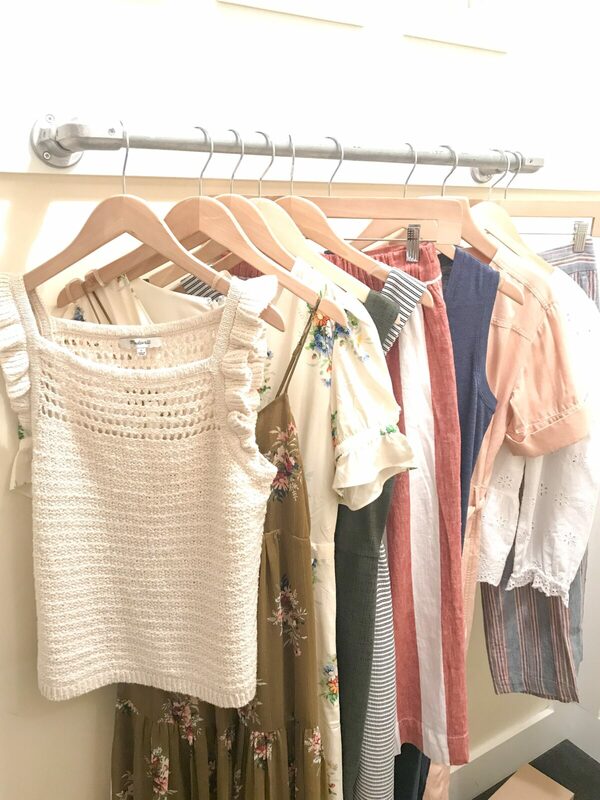 size verdict: true to size with a flowy fit. unfortunately not kind to long-torsoed gals. the 40% off sale runs through sunday! don’t forget to use the code FALLFEST at checkout.